This is the most comprehensive and well endowed web site focussing on the creation of terrain for wargaming. The site is designed very well, very easy on the eyes, loads fast and navigates with supreme ease. Subsections can be accessed from a side menu bar from any page. Considering the amount of images enclosed the laoding times are superb. The site is full of articles which atke the reader through the steps needed to create your own terrain. Separate sections deal with Bulidings, Hills & Rock, Trees & Forest, Rivers & Bridges and many more types of terrain. One section is devoted to the creation of themed gaming boards while the "Quickeies" section takes you through short tutorials on specific terrain. The "Inspiration" section is also a must to the visitor as it is full of images of various awe inspiriing terrain. The site is supported by its own forum for discussion on all thinsg terrain as well as a feedback section and submissions section for the visitors. Undoubtedly the best site for a gamer wanting to create realistic terrain for his battlefield. 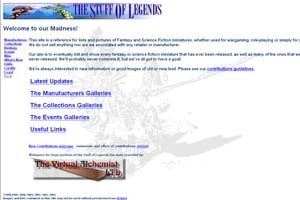 The most ambitious attempt on the web to gather together an image of every fantasy and science fiction miniature uder one banner. One must commend even the act of attempting such a gargantuan task, but the site in question accomplishes a lot more than simply try. Considering the large amount of images expected, the site loads fast and navigates with ease using a side menu bar. The first section lists the models accordingto manufacturers, who are listed in alphabetical order. This is the heart and soul of the site and is very awe inspiring. The next section contains personal colections of miniatures. There is a section on events, news and links along with the usual legal statements. The usefulness of this site is mostly for those who are avid converters of their models. This becomes a one stop shop for referencing potential models that you may be able to use on your mad coversions. 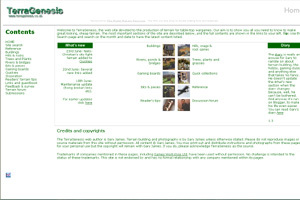 An essential resource site for the avid hobbyist.